Winzeler Stamping Company’s dedicated warehousing and logistics team ships to locations around the world. Not only can you expect first class precision stamped components, you can expect our products at your door when you need them. Winzeler Stamping Company enjoys a near 100% on-time delivery rating and has been selected as a preferred vendor to various OEMs and Tier One suppliers because of our reliability in quality and overall company performance. Our manufacturing facilities are located in Montpelier, Ohio just 4 miles from the Ohio Turnpike, the major East/West artery through the manufacturing belt in the Midwest. Our proximity to major manufacturing hubs, allows us to be a cost effective supplier with the ability to respond quickly with planned or unplanned demand requirements. If your company is located outside the Midwest or outside North America – no problem. Our logistics team successfully manages all domestic and international shipping requirements on a daily basis. Our customer-focused inventory control and management solutions are designed to provide a positive impact on your operations. The combination of production capability, quality assurance and warehousing capacity allows Winzeler Stamping Company to provide options such as Just-In-Time and Dock to Stock relationships to meet our customers’ needs. 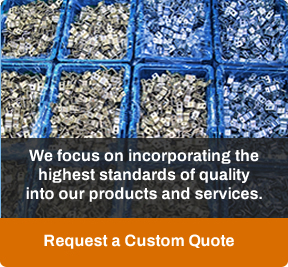 Winzeler Stamping Company accepts orders via EDI, Fax, Email or Phone. We also provide shipment notification, receive payments electronically, and offer value added services such as specialized packaging and bar coding. If you are looking for a vendor driven by operational excellence and a customer-first attitude, we would be pleased to talk with you about how we can meet your specific needs.